Money is no Object Comfort: Astute Moon VT Dual shell construction sets the Moon VT apart – from the competition and your money. Picking the right saddle is one of the most personal and paramount choices in cycling: get it wrong and no matter how great the rest of your bike is, you’ll never enjoy a ride. Get it right, however, and you’ll happily pedal mile after mile, day after day. Cyclists who have found the right saddle often refuse to ever use anything else. As the saying goes, “if it ain’t broke, don’t fix it.” It’s not unheard of for pros to use their favorite saddle season after season, re-branded to the current sponsor they’re supposed to be using. Unfortunately, many of us haven’t formed the same eternal bond with any one saddle and are actively searching for that perfect fit. The Moon VT Racing from Astute could end that search for many. 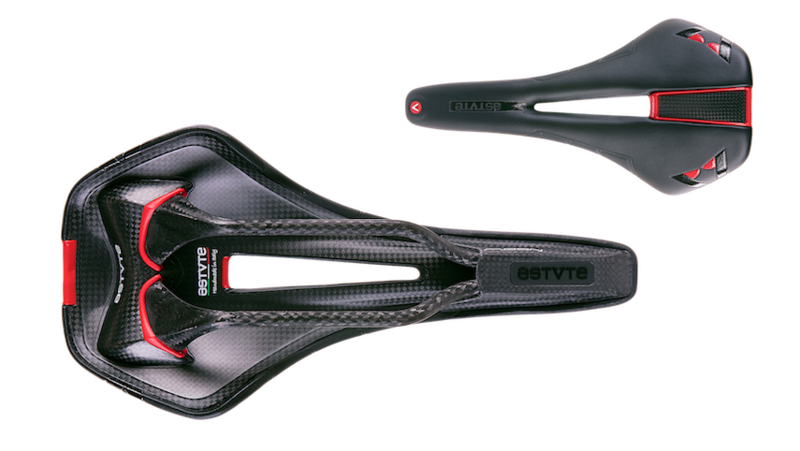 You’ve probably never put much thought into the engineering that goes into a high-end saddle. A couple rails and some padding – that’s all you’re getting, right? Think again. Astute developed a unique twin shell construction process that uses two separate, full carbon shells in conjunction with two pads to reduce road vibration and simultaneously strengthen the construction. This technology also allows for significantly more padding in the same volume as a traditional saddle, which, in addition to the central cut-out, helps reduce perineal pressure – a big plus for anyone who has ever finished a long ride fearing for their ability to have children. Carbon rails and a premium microfiber cover round out the package on this Italian, handmade saddle. All this technology is packed into a slim and clean silhouette weighing only 185g. The greatest compliment we can bestow upon this saddle is that we really didn’t think about it. That may seem like an odd form of praise, but at its core a saddle’s job is connect you to your bike and allow you to enjoy riding. It’s only when you realize you haven’t been distracted by any discomfort that you know a saddle is doing its job.